This form of social reading, and this recognition of belonging to a reading network, Manguel suggests, is under threat in the new world order of e-reading, where commuters can no longer see the titles, covers and spines of the books their fellow commuters are reading and only see the plastic boxes that deliver many titles and covers in secret. What this view fails to acknowledge, however, is that this act of recognition and the feeling it produces has a digital equivalent when it is replaced by a different form of social reading, networked beyond location, through platforms that support the integration of technologically-supported social networking into reading practices. The Kindle’s social highlighting function is one example of this. 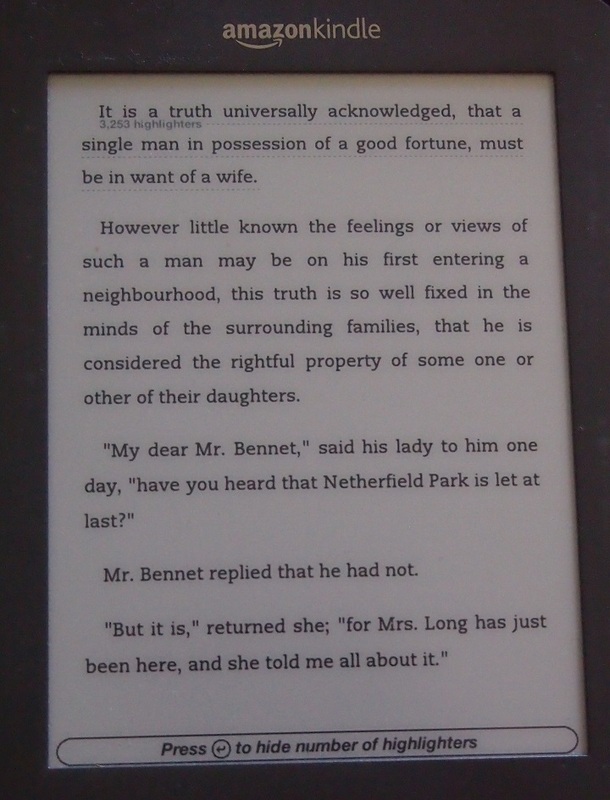 The Kindle’s place in the e-reading market is strong.1 To supplement the experience for its customers, Amazon introduced the Highlights function in 2010, allowing readers to select sections of the text and store and access those highlights on the device itself or on the ‘cloud’ (storage space on Amazon’s servers provided to the user). The function also displays on the screen of a Kindle book the number of readers who have highlighted a particular passage. Highlights display as a faint underlining with a number indicating how many people have highlighted the particular passage. Figure 1: The faint underline indicating that multiple readers had highlighted this section of the text. Users can switch off this function if they choose. Amazon collects data about the highlighting, displays the data on its Kindle webpage and maintains long lists of the most popular passages and books highlighted by Kindle readers. The number of highlights visible in popular texts indicates that the service is used by numerous people and for different purposes. Popular media raises concerns over privacy and the level of access to individuals’ reading habits that Amazon has built into the Kindle and the information it now gathers (Johnson). Other concerns include how this might impact reading in the longer term and whether perusing a collection of highlights on Amazon’s Kindle webpage may come to substitute for a reading of the text. And yet in the social networking era, transforming reading into a more mediated social activity creates a foundation for reading communities and enthusiasm. As a case study, I look closely at a series of highlights and notes from April 2012. From this, I consider the implications of social highlighting and social note taking on reading practices, readerships, and reading communities, as evidenced by the highlights and notes. I investigate the implications of the device-based and cloud-based popular highlights function on the Kindle for the practices of close and distant reading, and argue that close reading takes on different dimensions when it becomes a social networking practice. In addition, I use Katherine Hayles’ notion of hyper and deeper attention as a framework for considering the influence of social networking on technologically-supported reading practices. In analysing a series of highlights and notes from April 2012 made public on the Amazon Popular Highlights webpage, I identify the kinds of passages that are most frequently underlined and consider what that might tell us about reading practices, communities of reading and other instances of social reading.2 While I acknowledge that it is still too soon to tell how these paratextual practices may affect the reading experience , I contend that the new ways people are using books in digital environments is worthy of continued study. Moreover, my intent here is not to suggest binary oppositions between traditional and electronic reading practices or to suggest that one model of reading is inherently superior to the other. Rather, my intent is to sketch the reconfigurations of reading practices evident in and encouraged by socially networked reading and the challenges they pose to more traditional notions of literary consumption. Market success for e-reader devices and e-books is growing, coinciding with increased academic interest in reading in general, in the effect of reading on the brain, and in the future of literary reading within and outside the academy. According to a 2012 study by Rainie et al. for the Pew Research Center, 21% of American adults had read an e-book in the year prior to the survey. This number increased to 43% when the age bracket is reduced to 16 and when other electronic long-form content is included (Rainie et al. Web). However, in a finding that might dash hopes that e-reading will bring to the practice of close, longform and literary reading a generation said to be moving towards other forms of entertainment and knowledge acquisition, the Pew Report found that e-books are consumed mostly by avid readers of print books, suggesting that readers of print books have moved over to the e-book format more than non-readers have taken to reading via the electronic format (Rainie et al. 5). This has considerable implications for market analysis and for publishers, given that companies are trying to capture new reading publics with technology. Ed Finn writes that ‘the twenty-first century has brought significant changes to the social lives of books’ (177) and this has created ‘a vast, asynchronous conversation’ that is not ‘operating through the mass-mediated forms’ that usually generate and sanction public, semi-public and private discourses about books (177). Thus far, scholars in book studies have not provided much analysis of digital reading. There is a good deal of scholarship in pedagogies around digital reading for young adults and undergraduate students. Lisa Nakamura’s work on the GoodReads website, Julian Pinder’s work on LibraryThing and Ed Finn’s work on Amazon’s recommendations algorithms indicate a growing interest in the way online reading communities shape reading practices and interpretations. However, there has been little discussion of the social highlighting function Amazon has introduced and how it is being used by readers and non-readers alike. By considering the popular highlights and public notes of readers in the Kindle environment, we catch a glimpse of something of the way that readers are interacting with texts and ideas and with other readers. Given that these reading platforms continue to grow and attract new readerships, it is important to look to how they are being used. 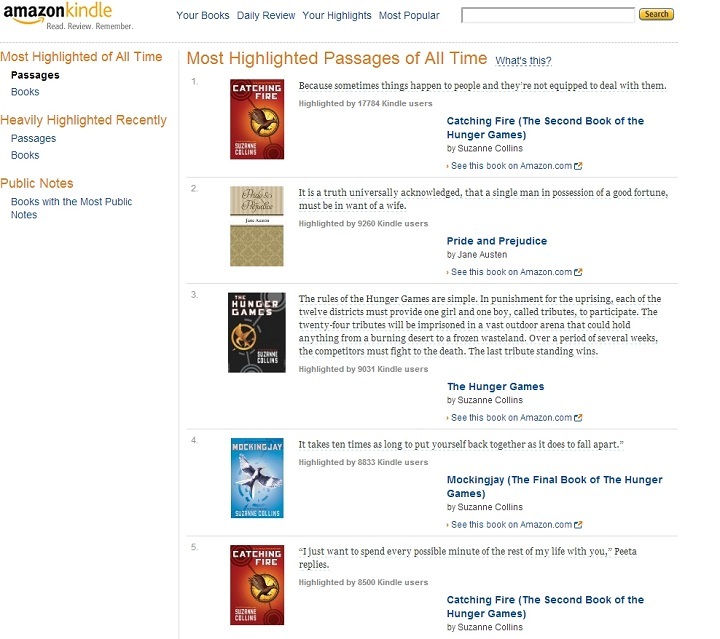 Amazon’s Popular Highlights page displays a series of lists that tabulate data about the most highlighted passages and the most highlighted books, and then breaks down that data across a number of different categories providing information on the passages that are most highlighted ‘recently’ and ‘of all time’ (Amazon ‘Most Highlighted Passages of All Time’). Amazon’s purpose here is likely to allow a place where current trends in reading and highlighting can be observed. However, it is important to note that the list of popular highlights and the number of people who have highlighted particular passages is not regularly updated. The list of highlights and the number of people who have highlighted each popular passage has not changed much between April 2012 and February 2014, suggesting that Amazon is not regularly updating the data. As a result, I propose to use the data as a case study, a snapshot in time, rather than as accurate and current data. Each individual passage on the list of popular highlights, however, includes a recently updated account of how many times it has been highlighted. My approach has been to examine Amazon’s lists of books and passages with highlights and notes and to consider the books that populate the lists, the kinds of passages that are highlighted, and the public notes that appear about them, as well as to briefly look at the profile pages of the users who are generating these highlights and notes (Amazon Kindle ‘Most Popular’). The popular highlights are split into four categories: Most Highlighted Passages of All Time, Most Highlighted Books of All Time, Most Highlighted Passages Recently and Most Highlighted Books Recently. In the same space, Amazon offers Books with the Most Public Notes. I will return to discussion of this data later. This quote comes from Suzanne Collins’s first book in the series. A year later, in May 2013, the number of people who highlighted this passage has jumped to 20,239 and in February 2014 it is listed as having been highlighted 21,651 times. These three highlighted passages are emblematic of the different types of quotes that appear frequently throughout the popular highlights lists. The first kind of quote is a sentimental statement, a Hallmark card or bumper sticker message designed to explain not the book or its characters so much as human nature or life. The second kind of quote is a famous passage, but one rather pointless to underline, to highlight, since it is already iconic and, as the opening line of a beloved work, easily retrievable. However, it is readily identifiable as important in the literary sphere and its frequency of highlighting indicates a tendency of readers to seek out the iconic. The third most popular passage highlighted might be considered a functional highlight: it outlines the raison d’etre for the book. It is the book’s topic sentence: it explains the logic of the series’ narrative setting and is the sort of statement that might be found on the back cover or in the book trailer. Looking further at the list of most popular passages highlighted, number four is another motivational statement: ‘It takes ten times as long to put yourself back together as it does to fall apart’. This one, too, comes from Collins’s Hunger Games series, specifically Mockingjay (Book 3). Number five is a romantic statement articulated by one of the series’ protagonist’s love interests—’“I just want to spend every possible minute of the rest of my life with you”, Peeta replies’—this time from Catching Fire. The Hunger Games series also accounts for 15 spots on the first 25 positions on the list5, encompassing a range of statements from the books that fall into similar categories: motivational statements, romantic sentiments and topic sentences. Although the list is titled ‘Most Highlighted Passages of All Time’, this is a misnomer, partly because Amazon is not updating the list regularly, but also because the technology and its highlighting function are so new, meaning that ‘All Time’ can only refer to the time since the technology was introduced. If we are looking to develop a typology of highlights amongst the Most Highlighted Passages, we might consider that the passages highlighted tend to fall into a range of consistent categories that illuminate not only the reception of the text—a kind of sentiment analysis—but also how meanings of and approaches towards texts (ways of reading, for example) are circulated in a social way. The highlights can be said to fall into the categories of inspirational statements, total plot summation statements, famous lines and romantic sentiments. The presence of Jane Austen, Arthur Conan Doyle and Oscar Wilde on the list may be related to the popularity of books that are out of copyright and therefore free, via Project Gutenberg and other sites, or low-cost or free from Amazon’s Kindle book store itself. Important to note here also is these authors’ continued dissemination in the public consciousness through popular culture such as film and television. In addition, the place of these texts on secondary and tertiary curricula may also account to some degree for their place on the highlighting list. Although a Christian text appeared in the top 50 of the Most Highlighted Passages of All Time list,7 the Bible itself did not appear there, most likely because of the sheer number of passages available to readers that might be considered candidates for highlighting in that one text. The variety of editions of the Bible is also a factor here as readers are accruing passages from several different versions rather than a single one. The list of passages Heavily Highlighted Recently conveys a similar story. Here, however, no figures about the number of highlighters are available. Of the top 25 passages listed, 23 are from The Hunger Games with one each from The Lucky One by Nicholas Sparks (at number 21) and The Power of Habit: Why We Do What We Do in Life and Business by Charles Duhigg (at number 25). Number 50 marks the first appearance of a new publishing trend, Fifty Shades of Grey by E.L. James, and this helps us to date the data at late 2011 or early 2012 (Amazon ‘Recently Heavily Highlighted Passages’). A fourth list, Heavily Highlighted Recently Books, again tells a different story to the passages heavily highlighted. Interesting here is the inclusion of textbooks, which indicates a growing use of social highlighting for study purposes. For example, the number one item on the Recently Heavily Highlighted Books list is Theory and Practice of Counselling and Psychotherapy, 8th edition, by Gerald Corey. For each of the books on this list, the most highlighted passage within the book is also provided. In this case it is: ‘The id is the biological component, the ego is the psychological component, and the superego is the social component’ (Amazon ‘Recently Heavily Highlighted Books’). Unlike the others, this list is dominated by non-fiction. In addition to textbooks from psychology, medicine, gynaecology, family practice and social psychology there are theological and Christian self-help texts, and self-help books about relationships. Number 4 is a passage from Why Does He Do That? : Inside the Minds of Angry and Controlling Men by Lundy Bancroft; number 8 is a section in Codependent No More: How to Stop Controlling Others and Start Caring for Yourself by Melody Beattie. This tells us something about the kinds of books readers most want to record passages from. This is clearer for textbooks used in education to support their study. Popular highlights lists reveal that formal education and fiction reading are not the only uses to which readers are putting these tools. The texts reflect not only the popularity of the self-help genre—consistently appearing in bestseller lists—but also perhaps indicates something about the way highlighting and note taking, public and private, are useful for both formal education and informal education. Using them for highlighting self-help and popular psychology brings another dimension to the usage and one that deserves further scrutiny. Highlighting is a diverse practice attracting a range of different kinds of users seeking to highlight a range of different kinds of texts. We can catch a glimpse of how highlighting might be useful not only for keeping a record of important things one reads but also, perhaps, for sharing self-help tips and for engaging publically with identity positions. 6. Dracula by Bram Stoker (395; up to 477). Also appearing in the top 25 books with the most public notes are Pride and Prejudice, The Holy Bible, all three books from the Stieg Larsson Millennium series (at 11, 17 and 22), three books from George R. R. Martin’s A Song of Ice and Fire series (from which the popular Game of Thrones television show is drawn) (12, 22 and 25), and The Autobiography of Benjamin Franklin (at number 13). Looking at the content of these public notes is illuminating because of the non-text related notations that appear. For example, the book with the most public notes, The New Oxford American Dictionary, contains the note: ‘Lol Paige. U may just be my new bff lol.’8 The same reader has also posted other public notes to this book like ‘I just had an A.M.T. (awkward moment time) lol’, ‘Bye paige’, and ‘Go to bed Remi’, as well as posts that consist of one or two periods or a question mark. On 5 May 2013, a user wrote: ‘If anybody see Blake come on plz tell him I asked him to check his and my book plz………………’. This indicates that users colonize specific books (or their Kindle pages on the Amazon website) for specific conversations and social configurations. This user’s list of public notes, listed on the user’s profile page as well as on the book the note was posted on, indicates that the Dictionary is not the only book used as a forum; this user has shared public notes attached to Alice’s Adventures in Wonderland, Fairy Tales Every Child Should Know, and The Three Musketeers as well. Notes like ‘Hey anyone on?’ strengthen the case that the page is used as an online social forum demanding immediate communication and reply from an existing social network rather than considered slow reading (Amazon Kindle ‘Unknown’). This indicates a use for the public note function beyond that which Amazon planned. The social reading aspects of the service have been turned by some users into a social networking forum. This kind of activity makes it almost impossible to find people sharing notes that are actually about the text on these popular but also occasionally arbitrary books, as in the case of Fairy Tales Every Child Should Know. When a reader accesses the Amazon website displaying public notes for a text—for these books at least—all they find are pages and pages of conversation unrelated to the book between people who have a history of interactions with each other within but excluding the book space. The notes show up like a feed of constantly updated social chatter—like a group chat on a popular forum. When they do occur, attempts to generate discussion about the book in question are swamped by the social chatter. Amazon provides no means to filter the posts. Many of the participants speak familiarly to each other, but it is unclear if any know each other in ‘real life’ or solely in the online space. They speak of getting offline to go to school but not of seeing each other at school. These texts have little in common to help identify why they might be chosen for this activity, but one reason for their choice as venues for social networking may be that they are or have been free e-books, easy to acquire for young people seeking to add new books to their Kindle libraries. These free or low cost, classic books are also less likely to attract notes and highlights from readers wanting to discuss the book, as we will see below in the discussion of the Hunger Games series of books, and thus will present fewer interruptions into the social interactions. The books are not in the best seller lists and so the readerships are smaller, which means there is more space for the social chatter conversations to take place. Books on the current bestseller lists are slightly different, however. On the Amazon Kindle highlights page for The Hunger Games, we are informed that 753 customers have Public Notes about this book, ranking it third. A user has highlighted ‘END OF BOOK ONE’ (5 May 2013); another reader also highlighted this passage and added a public note to it: ‘Nooooooooooooooo’ (4 May 2013). And a user spoils an important plot point when she writes ‘Everyone prim dies’ [sic] (3 May 2013), but elsewhere this reader engages with the text and the process of reading through the public notes tool with other notes including comments like ‘I can’t believe I only have 3 pages left’ (posted on a page titled ‘Mockingjay, the Final Book in the Hunger Games Series’) and ‘Wow she just got back and she’s already annoying’. These comments reflect a reaching out to a community of readers about the book in question. In response to the character Gale saying ‘Shoot me’, a user writes ‘No Gale she never will because you are so cool’. Here the reader speaks directly to the book itself, responding to a character’s comments in a way that mirrors an interaction with the character. Readers using printed books may respond personally to the fictional characters of a book but the social media conditions of internet fora emphasise the connection and facilitate an illusion of proximity between reader and characters that prompt such declarations. However, other books offer other kinds of interactions in their public notes. Perhaps predictably, for example, the popular highlights and notes for Thomas Pynchon’s The Crying of Lot 49 demonstrate readers trying to make sense of the text and approaching the novel in the manner of a puzzle. For example, in February 2013, a reader highlighted the name ‘Pierce Inverarity’ and added the note ‘why a name like this? it draws attention, must have a meaning, is this a math thing?’. Works that might be categorised as literary fiction also seem to display a much lower frequency of public notes and highlights, a different kind of readership, and serve a different function for the readers who are sharing notes. For one thing, the interaction between readers found in the notes for The Hunger Games books (not only in the form of social contact unrelated to the novel in question but also that relevant to the books, such as the kind seen in my discussion of the spoiler above) does not appear in any observable way on the pages of books that may be considered to be literary fiction, less populist or less likely to be used in the curricula of secondary education. That is, the public notes for the less populist books do not appear to contain any interaction. Clearly, more research is needed here on the distinction between highlights and public notes in popular, widely read, and circulated works and those on more esoteric, experimental or niche works, and in the way that works are colonised by groups of readers looking more for social chatter than for social reading. I do not want to make value judgements about the ways that certain kinds of books are used and by whom. In fact, I want to suggest that the social use of highlighting and notes platforms may serve as a foundation for life long reading because of the positive associations young people are forming around books and having a good time. Similarly, I found some evidence of the use of the Kindle Public Notes and Highlights features used to support student reading in Higher Education. In the Kindle editions of The History of Herodotus, volumes one and two, a user who identifies as an adjunct professor at a university in the United States, has marked and noted several key passages. The highlights and notes demonstrate a practice of directing the reading of students by asking important questions of students in relation to the text. For example, the user highlights the passage ‘of history declare that the Phenicians first began the quarrel. These’ and then adds the public note ‘How regularly does he cite his sources, and how regularly does he consider their credibility? What factors might influence his approach?’. The user’s 78 followers indicate a reading community at work in service of pedagogical ends. The user models a close reading practice asking questions at the moment in the text when a contemplation of the question by the reader may prompt deeper learning about the content and a more nuanced method of reading for learning. Some of the user’s followers have themselves made public their notes and highlights on these volumes. Sometimes these users are making the kind of notes that would be useful in the construction of a piece of assessment, at other times they are asking questions, either of the text or of the instructor, about the content of the reading. 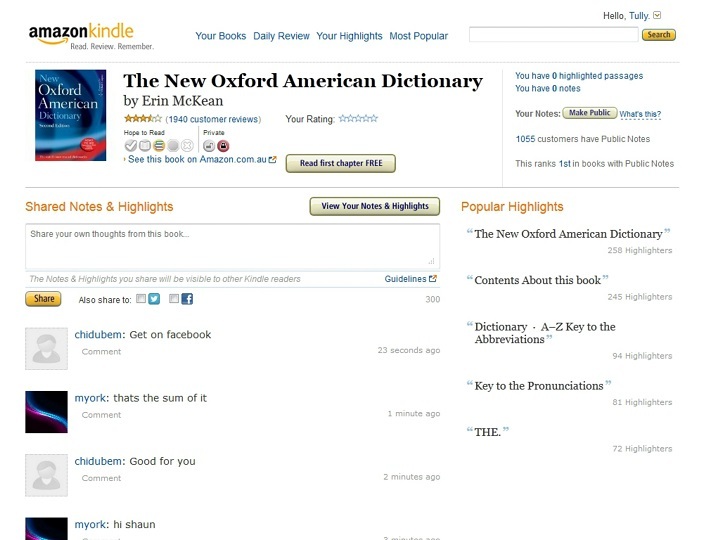 For contemporary authors, the Kindle’s social highlighting function can be used as a form of web 2.0 publicity. One example of this function is the Kindle highlighting profile of Timothy Ferriss, author of The Four Hour Work Week, and, according to the profile statistics, the most followed person on Amazon with 2,927 followers as of 5 May 2013. Ferriss uses blog and Twitter tools to promote his books and is noted for the lengths to which he will go to ensure that his books become bestsellers (Streitfeld ‘Tim Ferriss and Amazon Try to Reinvent Publishing’). He was also an early adopter of Kindle social highlighting as a means of connecting with readers. His profile page, under the name ‘Timothy C. Ferriss’, promotes his business web page. For many Kindle users, the highlighting function is a social networking tool. It is also a way to talk back to the book (‘that’s beautiful!’; ‘I don’t agree with this’), a way to talk back to the author (‘you’re an inspiration, Jaycee!’ writes a reader on the highlights page for Jaycee Lee Dugard’s memoir A Stolen Life; ‘I love this book thank you so much for making it! !’ writes a reader to Hunger Games creator Suzanne Collins), and a way to locate or build a community of likeminded readers (in theory). Kindle Public Notes offers opportunities not only for keeping a personal record of thoughts experienced while reading but also for the creation of reading communities, but as is often the case with new online platforms, the filtering is problematic. If a reader were interested in engaging with fellow readers about The New Oxford American Dictionary, they would be prevented from doing so by the use of the public notes feature for socialising about unrelated matters. Jackson further discusses the verse inscription as a practice in the circulation of books amongst friends (67-8). Book clubs, which tend to attract a high proportion of female members, have long been a means of returning the act of reading to the social sphere (Long; Taylor). The Kindle, it may be argued, builds upon this. But in recent years the notion of reading has received more critical attention, and the relationship between reading and this new technology of reading will be discussed below. In the last ten years, there has been a wave of research and popular science texts about what reading means and how it might be changing in the digital age. Stanislas Dehaene’s Reading in the Brain (2009), Maryanne Wolf’s Proust and the Squid (2010), Nicholas Carr’s The Shallows: What the Internet is Doing to Our Brains (2010) and Cathy N. Davidson’s Now You See It (2011) are recent examples of this move towards a deeper concern not only with the science of reading and the brain, but also the place of both reading and this scientific thinking about reading in culture and education. N. Katherine Hayles considers these texts and observes that humans are moving away from the cognitive mode of ‘deep attention’, characterised by the ability to concentrate on a single subject for long periods sourced by a single information stream, towards the cognitive mode of ‘hyper attention’, characterised by the tendency to prefer multiple sources of information and high levels of stimulation (Hayles How We Think). For Hayles these forms of reading bring with them ‘an expanded repertoire of reading strategies’ (How We Think 73). While Hayles displays some concern about the effects that this shift will have on culture and society, on literature and on the human capacity for reflection based on deep reading, she is largely neutral on the matter, suggesting only that changes in reading practices and the forms of attention that underpin them will require pedagogical adjustments. For Hayles, the practices of close reading, hyper reading and machine reading are intertwined.9 One must engage a form of hyper-reading, says Hayles, in order to determine which passages would benefit most from close reading. Considering these diversified reading strategies, then, we can see the Kindle as a tool lending itself to both close reading and distant reading. Franco Moretti uses the term distant reading to suggest the usefulness of methodologies that give a global view of the text, such as word frequency analysis and character mapping. Reader behaviours in popular highlights and public notes may provide further datasets to complement distant reading of texts by providing large data sets not about the content of texts, but of readers’ engagement with them. Meanwhile, readers can use the Kindle to attentively read the words on the screen, and can employ the tools available through the Kindle system to support close reading by highlighting passages and annotate the work. Highlighting and notes return close reading, close textual analysis, and reader interventions into the book to the forefront of ‘reading’ in the context of technologically mediated reading. This is in part an attempt to mimic the material conditions of reading printed texts where readers can underline passages in books, make notes in the margin or attach sticky notes. Readers etch their own words upon the text of the book, even if only in a shadow-aspect, in a compartmentalised note kept slightly separate from the main text of the novel. But where, as indicated above, readers of some texts focussed on their desire to talk back to the author, or to find friends who had also read the book, other highlights and notes pages demonstrated readers’ deeper engagement with the text. These tools may be useful for readers to keep a record of their progress through a text—an electronic equivalent to the sort of material record that some readers may have kept in the margins of a material printed book or on note paper tucked inside the sleeve—and in some instances they may represent the readers’ first experiences of engaging with note taking interventions into the text. What parts of the book are being highlighted or commented upon is instructive: some readers of some books are honing in on the iconic and instantly recognisable lines of a books, or the statements that explain the plot, or big sentiments, and key turning points in the text. This tells us something about how some readers engage with texts. Amazon is not the only company working on social reading. The Kobo website invites readers to ‘Explore. Unlock. Discuss. Share. Start your Reading Life with Kobo today’. According to the marketing, ‘Kobo Pulse gives readers a voice. Share ideas on passages and books with other readers’ (Kobo Website). The extent to which this marketing strategy emphasises the social media side of the web indicates an awareness of the potential growth in social reading; in this model readers are emphasised as active participants in a way that was less obvious or less emphasised prior to the social web. This promise is elaborated on under the heading ‘Get More Out of Reading’ where readers are encouraged to: ‘Follow conversations and see what other readers thought of what you just read’. This may appeal to the hyper-reading mentality, where multiple channels of information supplement the close attention to the text. But Kobo’s unique contribution to the field is the incorporation of gamification into e-reading. In Kobo, not only can you share your reading habits and experiences with others, the reader can also earn awards for the reading he or she undertakes. The Kobo page declares: ‘Awards help celebrate fun milestones in your Reading Life. Earn an award for starting a new book, reading through the night, sharing a passage and more’ (Kobo website). Amazon’s recent acquisition of the social reading website ‘Goodreads’ highlights the company’s commitment to exploring the benefits of social reading for supporting the e-reading industry. Clearly, social e-reading is likely to grow, and will continue to evolve in light of technological change and social networking directions. While Alberto Manguel’s sense of loss over the ability to spy on what other people are reading may seem trivial, it represents a key component of the way passionate readers of literature see their relationship with their favourite books and with other readers of those books. However, for other users, a shift from material bookshelves to virtual bookshelves allows for a wider circulation of that same impulse of sharing and identification beyond chance encounters on trains or browsing the books displayed in someone’s home. This is indicative of the ebb and flow of meaning generated around reading and book cultures in print and in online spaces. Here I have attempted to think through some of the ramifications of the Amazon Kindle Highlighting and Public Notes functions on reading and readerships. On the one hand, Amazon’s integration of social networking into the Kindle e-book system creates readings that might never have happened and, for some commentators, all reading is good reading when the fear over the decline of the book is so strong. The demarcation of books as vibrant, lively places for the exchange of ideas can only be good for the long term survival of a skill essential for democracy, for civic engagement, for economic growth and for culture. On the other hand, the kinds of reading engagement occurring on the platform can have very little to do with reading or with the text in many cases, and may have only a cursory connection in many more. These reading communities tend to produce a ‘conversation about’ or even ‘conversation near’ rather than ‘reading of’ the texts. Clearly, a quantitative study of the Amazon Kindle highlighting and public notes functions would be useful. The implications these features have for reading and for the interpretative contexts in which reading takes place are yet to be seen. Where Striphas sees the Kindle’s data collection as part of the abstraction and commodification of reading where its ‘value resides almost exclusively in its economic instrumentality’, educators may see the opportunity for technology-supported reading communities inside the book (Striphas 306). The impact of the construction of a reading community as a social network within the digital space provided and owned by the bookseller—a bookseller that, as we have seen, is having a profound influence on every aspect of the book industry from production to reception—is a marker of the technological and market-driven construction of the spaces for the reception of texts in digital reading. 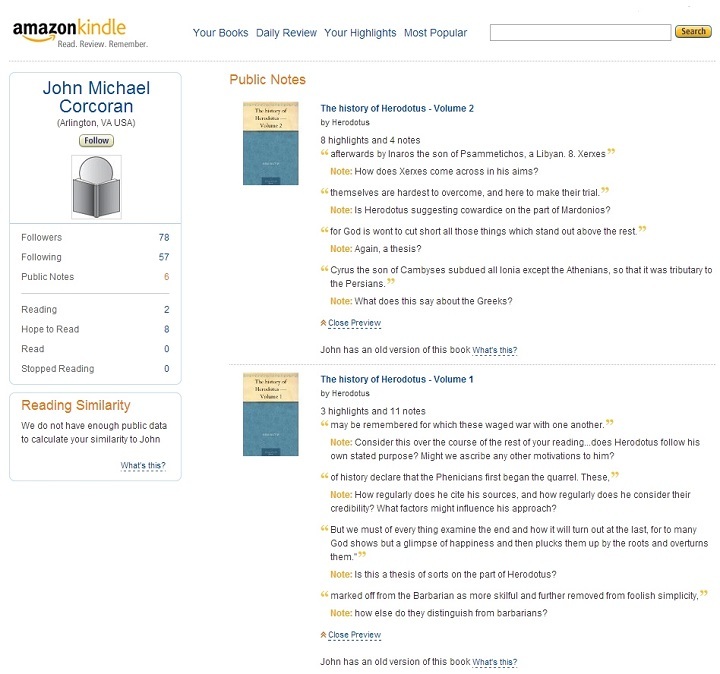 The Amazon Kindle Public Notes and Highlights functions suggest the promise of facilitating deeper reading conducted across social networks, of motivation for reading for reluctant readers, for productive readings in educational settings, and for guided readings through the involvement of teachers of literature and authors themselves. However, in practice, social reading on the Kindle is messier and raises concerns about the challenges, tensions and inanities inherent in performing the act of reading—whether educationally or recreationally—using a socially networked and commercially-oriented technology, conflating reading about books or reading next to the book for the reading of the book itself. Further research is warranted into how these technologies are reconfiguring the act of reading for twenty-first century users, how these technologies lend themselves to both close and hyper modes of reading—sometimes complementary, sometimes conflicting—and the long term ramifications and opportunities derived from these reconfigurations. Tully Barnett is a Research Fellow at Flinders University in South Australia. She completed a PhD in English literature with a focus on representations of information technology in literary fiction and now researches reading in digital environments among other issues. 1 In April 2012, Amazon was thought to own 60 per cent of the e-book market (Streitfeld ‘Cut in ebook pricing’ and Reynolds). 2 However, I note that Amazon’s ranking of highlights, and the number of people who have highlighted each passage, which is available on the Kindle Popular Highlights webpages, has not changed since I first began this research in April 2012. 3 The Authors Guild in the United States has accused Amazon of engaging in ‘vertical integration’ in that it influences the production, circulation, consumption, reception, and content of books. See Authors Guild press release ‘Turow on Amazon/Goodreads: This is how modern monopolies can be built’. 4 Amazon indicates how many other people highlighted a particular passage (anonymously) and publishes on its website a ‘popular highlights’ section that reveals how many people highlighted which passages of which books and, if you permit Amazon to do so, makes your notes public. It is also a means by which Amazon collects as data information about users’ reading practices and the highlights and notes they make. 5 Numbers 6, 8, 9, 10, 11, 12, 13, 14, 15, 17, 18, 20, 21, 22, and 24. 6 Other kinds of texts further down the list include Cutting for Stone by Abraham Verghese, which spent several years on the New York Times bestseller list, The Adventures of Sherlock Holmes by Sir Arthur Conan Doyle, Heaven is for Real: A Little Boy’s Astounding Story of His Trip to Heaven and Back by Todd, Sonja and Colton Burpo, The Picture of Dorian Gray by Oscar Wilde, The Habits of Highly Effective People, and Radical: Taking Back Your Faith from the American Dream, quotes from Walter Isaacson’s biography of Steve Jobs and several passages from Eat, Pray, Love. 7 Heaven is for Real: A Little Boy’s Astounding Story of His Trip to Heaven and Back by Todd, Sonja and Colton Burpo. 8 In the interests of protecting the privacy of users of the Kindle highlighting function, I have removed the usernames of commenters and also the URLs of the pages since they give the usernames. I have collected screen captures of the phenomena. 9 For Hayles, hyperreading is ‘computer-assisted human reading’ such as digital reading and machine reading is ‘human-assisted machine reading’ such as the use of algorithms to determine word frequencies, visualisation tools and other quantitative methodologies. Alter, Alexandra, ‘Your E-Book Is Reading You.’ The Wall Street Journal, 19 July 2012. <http://online.wsj.com/article/SB10001424052702304870304577490950051438304.html> Accessed 6 May 2013. Amazon Kindle, ‘Books With the Most Public Notes.’ <https://kindle.amazon. com/most_popular/books_by_public_noters>. Accessed 6 May 2013. 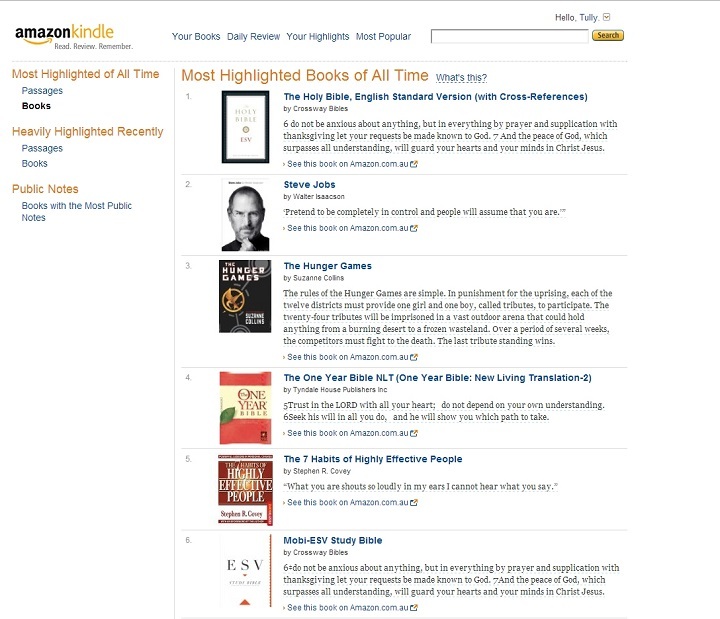 Amazon Kindle, ‘Most Highlighted Books of All Time.’ <https://kindle.amazon.com/most_popular/books_by_popular_highlights_all_time>. Accessed 6 May 2013. Amazon Kindle, ‘Most Highlighted Passages of All Time.’ <https://kindle.amazon. com/most_popular>. Accessed 6 May 2013. Amazon Kindle, ‘Most Popular.’ <https://kindle.amazon.com/most_popular> Accessed 6 May 2013. Amazon Kindle, ‘Recently Heavily Highlighted Passages.’ <https://kindle.amazon. com/most_popular/highlights_recently>. Accessed 6 May 2013. Amazon Kindle, ‘Recently Heavily Highlighted Books’. <https://kindle.amazon.com/most_popular/books_by_popular_highlights_recently>. Accessed 6 May 2013. Bérubé, Michael, Hester Blum, Christopher Castiglia, and Julia Spicher Kasdorf, ‘Community Reading and Social Imagination.’ PMLA 125 (2010): 418-25. Codrescu, Andrei. ‘E-Book Tarnishes the Reader-Book Relationship.’ National Public Radio All Things Considered. Robert Siegel. 7 March 2011. <http://www.npr.org/2011/03/07/134342235/E-Book-Tarnishes-The-Reader-Book-Relationship>. Accessed 5 May 2013. Finn, Ed. ‘New Literary Cultures: Mapping the Digital Networks of Toni Morrison’. From Codex to Hypertext: Reading at the Turn of the Twenty-First Century Ed. Anouk Lang. Amherst and Boston, U of Massachusetts P, 2012, 177-202. Fuller, Danielle and DeNel Rehberg Sedo. Reading Beyond the Book: The Social Practices of Contemporary Literary Culture. New York: Routledge, 2013. Hayles, N. Katherine. How We Think: Digital Media and Contemporary Technogenesis. Chicago: U of Chicago P, 2012. Hayles, N. Katherine. ‘How We Read: Close, Hyper, Machine.’ ADE Bulletin 150 (2010): 62-79. <http://mmize.digitalodu.com/courses/wp-content/uploads/2013/05/Hayles.pdf>. Accessed 17 Mar. 2014. Jackson, H. J. Marginalia: Readers writing in books. New Haven, CT: Yale UP, 2001. Johnson, Steven. ‘Yes, People Still Read, but Now It’s Social.’ The New York Times. 19 June 2010. <http://www.nytimes.com/2010/06/20/ business/ 20unbox.html?_r=0>. Accessed 11 Oct. 2012. Kobo Website, ‘A New World of Social Reading.’ <http://www.kobobooks.com/readinglife>. Accessed 6 May 2013. Liu, Alan. ‘From Reading to Social Computing.’ Literary Studies in a Digital Age. MLA Commons. <http://dlsanthology.commons.mla.org/from-reading-to-social-computing/>. Long, Elizabeth. Book Clubs: Women and the Uses of Reading in Everyday Life. Chicago: U of Chicago P, 2003. Nakamura, Lisa. ‘“Words with Friends”: Socially Networked Reading on Goodreads.’ PMLA 128.1 (2013): 238-43. Pinder, Julian. ‘Online Literary Communities: A Case Study of LibraryThing.’ From Codex to Hypertext: Reading at the Turn of the Twenty-First Century. Ed. Anouk Lang. Amherst and Boston, U of Massachusetts P, 2012. 68-87. Rainie, Lee, Kathryn Zickuhr, Kristen Purcell, Mary Madden, and Joanna Brenner. The Rise of E-reading. PEW Research Center. 2012. Available: <http://libraries.pewinternet.org/2012/04/04/the-rise-of-e-reading/> Accessed 22 Jun. 2012. Reynolds, Rob. ‘Trends Influencing the Growth of Digital Textbooks in US Higher Education.’ Publishing Research Quarterly 27.2 (2011): 178-87. Streitfeld, David. ‘Cut in E-Book Pricing by Amazon is Set to Shake Rivals’, The New York Times, 11 April 2012. <http://www.nytimes.com/2012/04/12/business/media/amazon-to-cut-e-book-prices-shaking-rivals.html>. Accessed 29 Apr. 2013. —. ‘Tim Ferriss and Amazon Try to Reinvent Publishing.’ The New York Times, 20 November 2012. <http://bits.blogs.nytimes.com/2012/11/20/tim-ferriss-and-amazon-try-to-reinvent-publishing/>. Accessed 6 May 2012. Striphas, Ted. ‘The Abuses of Literacy: Amazon Kindle and the Right to Read.’ Communication and Critical/Cultural Studies 7.3 (2010) 297-317. Taylor, Joan Bessman. ‘Producing Meaning Through Interaction: Book Groups and the Social Context of Reading.’ From Codex to Hypertext: Reading at the Turn of the Twenty-First Century. Ed. Anouk Lang. Amherst: U of Massachusetts P, 2012. 142-58.